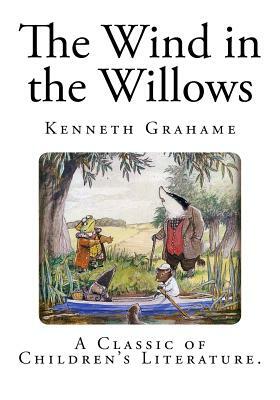 The Wind in the Willows - Complete Edition - By Kenneth Grahame - A Classic of Children's Literature. The Wind in the Willows is a classic of children's literature by Kenneth Grahame, first published in 1908. Alternately slow moving and fast paced, it focuses on four anthropomorphised animal characters in a pastoral version of England. The novel is notable for its mixture of mysticism, adventure, morality, and camaraderie and celebrated for its evocation of the nature of the Thames valley. In 1908 Grahame retired from his position as secretary of the Bank of England. He moved back to Cookham, Berkshire, where he had been brought up and spent his time by the River Thames doing much as the animal characters in his book do-namely, as one of the phrases from the book says, "simply messing about in boats"-and wrote down the bed-time stories he had been telling his son Alistair. In 1909, Theodore Roosevelt, then US president, wrote to Grahame to tell him that he had "read it and reread it, and have come to accept the characters as old friends." The novel was in its thirty-first printing when playwright A. A. Milne adapted a part of it for the stage as Toad of Toad Hall in 1929. In 2003, The Wind in the Willows was listed at number 16 on the BBC's survey The Big Read.